There are many ways in which you can let your application handle failover situations and here are some suggestions I had used in my past projects. But before you start with my suggestions, make sure that you have the same database names for both and the same goes for user accounts and permissions. The items here are ordered on how highly I suggest each solution. If item 1 does not meet your requirement or it’s impossible to do, the next best thing is using this method. You just need to change your config files to point to the assigned CNAME (and that’s all you have to do unless there are some hard coded server names), the change of CNAME can be done automatically or manually and its network admins your choice which option they want to do. What this does is your network guys assign an alias for your Database Server so for example you have a database name called DBServer1which is the primary and DBServer2 which is the mirror. They can create an alias called DBServerDNS which points to DBServer1, then in a case of failover the entry will be then be changed to DBServer2, which you don’t need to worry as your application connects to DBServerDNS all the time. 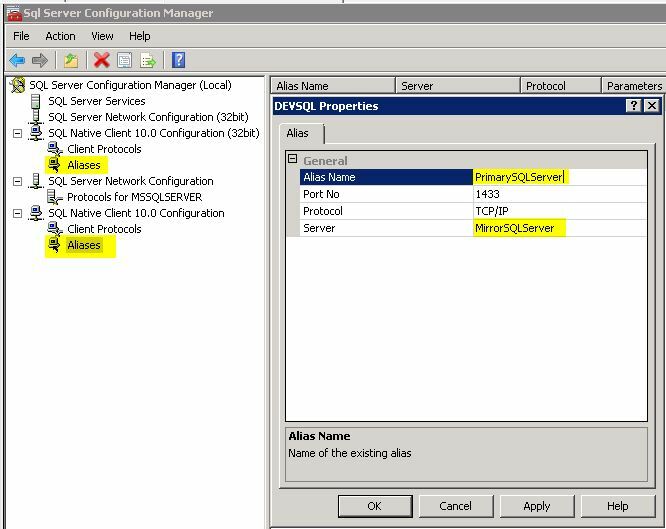 Create a SQL Server alias – just go to SQL Server Configuration Manager and add a SQL Server Alias setting. With this, you don’t need to modify any connection strings on your application and when the real server goes back to life, just remove the alias setting. Depending on how your applications are written using the solutions above (item 1 and 2) doesn’t mean that your application will not crash as that the network connection to the database server will be lost during a failover and if the exception is not properly handled, then issues will arise. So the best way to do this is to Dispose any commands you are running on the failed SQL Server and Close all the connections so you can reconnect properly on the Mirror Server on the next Execute Command.